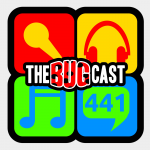 This week on The Bugcast: Dave and Caroline are back for their Christmas episode, with no Christmas songs in sight, but instead 8 amazing tracks of Creative Commons music! Thanks to Ro for episode 440! Apparently we’re invited to host DarkCompass in the new year! Dave is now officially in a band! Planning starts for episode 450 – have a think about your favourite tracks from episode 403 onwards! The next live show will be episode 442, which will be broadcast live in the chatroom on Friday 30 December 2016 at 21:30-ish UK time (GMT/UTC).